This month, we sat down with the newly established Sexual and Gender Minority Research Office at the National Institutes of Health to learn more about their operations and the future of SGM biomedical research. SGM is an acronym meaning 'Sexual and Gender Minority.' It is an umbrella term that encompasses lesbian, gay, bisexual, and transgender populations as well as those whose sexual orientation, gender identity and expressions, or reproductive development varies from traditional, societal, cultural, or physiological norms. 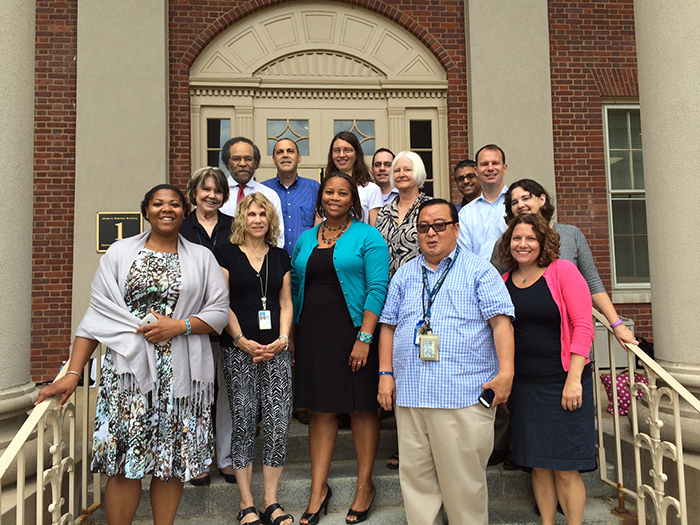 Can you tell us about the newly-established Sexual & Gender Minority Research Office at NIH? As the world’s largest biomedical research organization, NIH should lead the way in supporting SGM-related research and cultivating a safe and welcoming environment for SGM persons to work. That is why in late 2015, NIH established the Sexual & Gender Minority Research Office, located here in the Office of the Director in the Division of Program Coordination, Planning, and Strategic Initiatives. In addition to the SGMRO, our trans-NIH SGM Research Coordinating Committee works to improve collaboration and communication across our 27 Institutes and Centers and serves as a catalyst for developing additional research and research training initiatives in these areas. Why is SGM health research important? The March 2011 report of the IOM (subsequently renamed the National Academy of Medicine), requested by NIH, was the first comprehensive review of then-current scientific knowledge on the health and health research needs of U.S. lesbian, gay, bisexual, and transgender populations. The report’s first recommendation called for NIH to implement a research agenda to advance knowledge and understanding of LGBT health, because existing data were "sparse" or non-existent. More research, together with more well-trained researchers, was needed to protect and improve the health of these understudied populations. SGM individuals face a variety of unique health concerns and are at elevated risk for certain disorders, such as depression and suicide, exposure to violence and stigma, and certain cancers. Due to the dearth of research in this area, focusing on a basic understanding of disparities and unique health needs is critical. How is NIH situated to lead the biomedical community and others on SGM research? As the world’s leader in biomedical research, it is important for us to clearly articulate, through our words and our actions, how important it is to better understand the health of SGM populations. The years of planning and coordination that precipitated the establishment of the SGMRO have positioned us to lead nationally. To make progress in eliminating health disparities in SGM communities, it was critical to establish a space that is solely dedicated to facilitating SGM-related research and to strengthening the community of scholars interested in exploring the unique health-related research questions in these populations. What is guiding NIH’s approach to SGM issues? The SGMRO is spearheading our efforts to implement the NIH 2016-2020 Strategic Plan to Advance Research on the Health and Well-being of Sexual and Gender Minorities. The goals of the strategic plan highlight areas that we believe can be addressed inside NIH, and across the US through our extramural research. We hope to expand the knowledge base in this area of science, including research on methods and methodologies, remove barriers to conducting this work, and strengthen the community of scholars in this field of study. And of course, we want to be sure that we are tracking our progress across these goal areas. What are some challenges to conducting research on SGM populations? We know that SGM populations make up at least 2% of the general population, however, accessing individuals in order to conduct relevant research is often difficult due to small numbers. There are important questions related to sampling methods and recruiting small populations that need to be considered and better understood as we increase research in this area of inquiry. Additionally, there is a lack of understanding of the health disparities and specific health needs of SGM communities. What can researchers do right now to advance SGM research? One of the best ways to prepare or advance your research is to educate yourself about the health needs of SGM communities. Designing research to include these communities is good science. Whether a researcher is new to SGM issues or has been engaged for years, the ability to learn and grow in our understanding of SGM issues is nearly limitless. During Pride Month this year, NIH will be highlighting issues related to data collection, transgender health, and the important intersections between SGM and other identities. We encourage people to come out and learn more about the important health and research needs in SGM communities. What is the "promise" of SGM research to the overall health of the nation? What are the long-term impacts of this work to health research? There is a high level of diversity among the various groups that make up the SGM community. Key areas of SGM research include the following: social influences, health care inequities, intervention research, bisexual health, and transgender-specific health needs. Gaining a better understanding of these areas, among others, will certainly increase understanding in other populations, thus improving the health of the nation as a whole. Learn more about the SGM Research Committee.